The primary periodical published exclusively for the stein collector is Prosit, the quarterly publication of Stein Collectors International (SCI). To date, over 130 issues and more than 3200 pages have appeared. Current issues are by membership in SCI with some back issues being available through SCI. To facilitate research using this periodical, Col. Lester E. Hopper, AUS (Ret), has compiled and published a two-volume index: Volume 1, Issues 1 - 106 and Volume 2, Issues 1 - 28. That index is available in the SCI web site library. Some of the local chapters of SCI publish newsletters which provide informative articles about beer steins. These newsletters are distributed within the chapter membership and most current newsletters can be found on the SCI web site's Chapters page. Several European Periodicals include material on steins and stein collecting. A short compilation and description of the most popular and useful stein reference books is given below, and that is followed by "The Stein Collector's Bookshelf". These books range in content from broad surveys of all types of steins, to specialized texts focusing on some of the most popular areas of collecting. Also included in this list is a guide to translating the verses and expressions found on beer steins. If you only own one book about beer steins, The Beer Stein Book, by Gary Kirsner, is recommended. The third edition of this book became available in November 1999, and it includes some new and expanded sections, especially those on Art Nouveau, Brewery and Modern Brewery steins. The listing of manufacturer's marks has been expanded (although fewer Mettlach marks are shown). Unfortunately, in my copy many of the line drawings are "fuzzy", and the black and white photographs are dark. If you don't need the absolute latest reference, the second edition of this book may be available on the secondary market, and is a good alternative. Both editions provide information about the history and production of beer steins, and give a broad survey of the various types of steins. Steins made by the Mettlach factory of Villeroy and Boch are popular, plentiful and pricey. The authoritative reference here is The Mettlach Book, 4th ed. (2005), by Gary Kirsner. Unless you have made a conscious decision to avoid Mettlach steins, this book will prove very useful. Most general stein collectors will also want information about character steins. Two references are suggested here: Character Steins, A Collector's Guide (1987), by Eugene V. Manusov and Mike Wald, and its predecessor, The Encyclopedia of Character Steins (1976), by Eugene V. Manusov. There is little duplication in the two works, although the earlier work may be quite difficult to find. Regimental collectors will appreciate the wealth of information contained in Regimental Beer Steins (Reservistenkrüge) 1890 - 1914, by Ron Heiligenstein, or Regimental Steins, by John Harrell (very difficult to find). Even the most novice or casual collector of German beer steins will have occasion to wonder about the verse or inscription on a stein. Translating these words and phrases into English is sometimes made more difficult by the use of an old German Fraktur font. In his book EIN TAUSEND UND EINE UBERSETZUNGEN VON DEUTSCHEN BIERKRUG SPRUECHE (1001 German Beer Stein Translations) Les Hopper provides assistance in recognizing the old alphabets and provides the translations promised by the title! This work is available in the SCI web site library. The most popular references for areas of special interest to beer stein collectors are included in "The Stein Collector's Bookshelf" below. Many other, even more highly specialized references exist. As you might suspect, many are written entirely in German, are difficult to find, and may be quite expensive. A short list of some of those is given in the Appendix. As you read over the following list you will note that virtually all of these books are out of print. While the most useful reference works cited above should be found with a modest search of the secondary market, others are quite difficult to find. That should not discourage you, but should make you alert for opportunities to purchase these books when you do see them. In addition, many of these works can be accessed through SCI's Museum and Archives. *Adler, Dr. Beatrix and *Paul, Les, with photographs by *Johannes Vogt. Early Stoneware Steins from the Les Paul Collection, Krüger Druck + Verlag, Dillingen/Saar, 2005. 464 pages, 9.5" x 12", side-by-side English and German text, lavishly illustrated with large format color photos. Each of 17 centers of German stoneware production are examined from geographic, historical and cultural viewpoints, with special emphasis on the development of the stoneware industry, its practitioners, their techniques and characteristics. The first time you make - or avoid - the purchase of an early stoneware stein based upon the information in this book, you will likely recoup your initial investment. Beyond that, this book promises many years of enjoyable study. There is no other English text which approaches this one for information about early stoneware steins. Anonymous compilation, Die Wandmalereien im Ratskeller zu Wiesbaden, Verlag von Gebruder Petmecky(? ), not dated. Softcover, 5.75" x 8.25", 182 pages, German. Tales and verses accompanying illustrations of the murals in Wiesbaden Ratskellers by Heinrich Schlitt and Kaspar Kögler. A very enjoyable and frequently humorous collection of sketches and verses. Out of print, very difficult to find. Brett, Vanessa; Phaidon Guide to Pewter; Englewood Cliffs, NJ; Prentice-Hall, Incorporated; 1982. Soft cover, 8.5" x 6", 256 page, English. This is a well-illustrated basic book on pewter which shows steins of many countries. Arranged by country of origin, it covers the production of pewter pieces and includes a section on Pewter Marks and an excellent Glossary. Harrell, Major (Ret) John L.; Regimental Steins; Frederick, MD; The Old Soldier Press; 1979. Hardcover, 7.5" x 11", 250 pages, English. Includes lengthy discussion of the characteristics of Reservist steins, German military service, organization of the Imperial German Armies and Navy, Regimental insignia; profusively illustrated in b&w. For many years this was the only authoritative guide for Regimental steins. Out of print, difficult to find. *Heiligenstein, R. Ron; Regimental Beer Steins (Reservistenkrüge) 1890 - 1914; Milwaukee, WI; 1997. Hardcover, 12.25" x 9.25", 295 pages, text in both English and German. Includes history, organization and service in the Imperial German Armies and Navy, discussion of characteristics of Regimental beer steins, and hundreds of steins fully described and photographed in full color. Available from the author. *Hopper, Colonel (Ret) Lester E.; EIN TAUSEND UND EINE UBERSETZUNGEN VON DEUTSCHEN BIERKRUG SPRUECHE (1001 German Beer Stein Translations); New Orleans, LA; Al. E. Gator Press; 1994. Softcover, 8.25" x 11.25", English. Includes an introductory chapter on how to read old German print and script. German verses and expressions commonly found on steins are presented in alphabetic order, with their English translation. Out of print, occasionally available in the secondary market. This work is available in the SCI web site library. Huebner, Frank; Reservistenkrüge und Reservistenpfifen; Munich, Germany; George O. Callwey; 1982. Hardcover, 291 pages, 8 x 8 1/2 inches, text is in German. In addition to the usual material on Reservist (Regimental) Steins, this book includes material on Reservist's Pipes and other associated remembrances. It is extremely well illustrated with a profusion of both color and black and white photographs. Out of print, difficult to find. *Kirsner, Gary; The Beer Stein Book, A 400 Year History; Coral Springs, FL; Glentiques Limited; 1999. Hardcover, 8.5" x 11", 384 pages, English. Expanded in scope and content and updated from its 1990 predecessor. 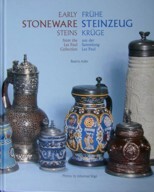 Includes chapters on the history of steins, production of steins, terminology and characteristics, marks, effects of condition on price, and information for collectors, plus illustrated sections on all primary categories of steins (e.g., early stoneware, faience, porcelain, glass, occupational, character, brewery, modern, etc.). Over 2700 beer steins illustrated, including 32 pages of color, with price estimates. This book contains a wealth of information for all collectors from beginning to advanced. *Kirsner, Gary; The Mettlach Book (4th Ed. ); Coral Springs, FL; Glentiques Limited, Incorporated; 2005. Hardcover, 8.75" x 11.25", 472 pages, English and German. The latest edition of what has long been the standard Mettlach reference source for most dealers and collectors. It includes informative chapters on Mettlach history, trademarks, production, and valuation factors, plus the most extensive modern illustrated catalog of Mettlach wares. Profusely illustrated in b&w plus 16 pages in full color, the book includes price estimates based upon extensive knowledge of the market by a specialist in stein sales. In addition to updated valuations, this edition greatly expands upon prior editions: over 3000 items are illustrated, more than 4200 items are described and priced. *Kirsner, Gary; German Military Steins, 1914-1945, Deutsche Militärkrüge; Coral Springs, FL; Glentiques Limited, Inc.; 1989. Softcover, 6" x 9", 96 pages, English. This book covers the period from the outbreak of World War I to the conclusion of World War II. It does not include reservist steins of the Imperial Army or Navy. Over 260 steins are illustrated and described, and estimated values provided. Information about history, marks, stein terminology, and a glossary are also provided. Out of print, occasionally found on the secondary market. *Lowenstein, Jack and *Clarke, Pat; English Translation, 1899 Mettlach Catalog with Supplement, Steins; Princeton, NJ; Patrick J. Clarke and Jack G. Lowenstein; 1974. Softcover, English. A translation of the Villeroy and Boch Mettlach Provisional Price List of 1906, showing size, the Mettlach description, and the 1906 price. Out of print, rarely found. *Manusov, Dr. Eugene; Encyclopedia of Character Steins; Des Moines, IA; Wallace-Homestead Book Company; 1976. Softcover, 8.5" x 11", 210 pages, English. Includes introductory articles about character steins and marks, plus more than 450 photographs and descriptions of character steins. Organized by category (e.g., Animals, Munich Child, Skulls and Satans), this was the first comprehensive character stein reference available to collectors, and steins are frequently referred to by using their figure number in this book (e.g., ECS264 is the Bismark radish). Out of print, difficult to find. *Manusov, Eugene V. and *Wald, Mike; Character Steins, A Collector's Guide; NY, NY; Cornwall Books; 1987. Hardcover, 9" x 12", 271 pages, English, profusely illustrated in b&w and color. This is a follow-on work to the one listed above. The book includes 72 pages of introductory material, including an article about the manufacture of Musterschutz (Schierholz) porcelain character steins. Also included are copies of pages from original catalogs, providing evidence of the manufacturer of many unmarked character steins. Hundreds of character steins are depicted and described. This book is a supplement to The Encyclopedia of Character Steins, and there is very little overlap in content. Out of print, may be found on the secondary market. *Manusov, Patricia L. and *Manusov, Eugene V.; A Collector's Guide to Diesinger Steins; Los Angeles, CA; Bristol Press; 1991. Softcover, 8.25" x 10.75", 90 pages, English. Includes a history of investigations into D.R.G.M. and Diesinger, common characteristics in handles, thumblifts, and decorative touches, and an illustrated catalog of numerous Diesinger steins, complete with descriptions. Includes a four-page color insert. Out of print, difficult to find. Münchner Stadtmuseum: Das Münchner Kindl; Munich, 2000. Softcover, 8.75" x 11.25", 292 pages, German. Published to accompany an exhibition held between October 8, 1999, and January 9, 2000. Lavishly illustrated in both black and white and color, the catalog opens with a discussion of the history, origin and evolution of the monk as the official seal of Munich. It turns then to the many decorative ways in which this symbol has been used, including beer steins, postcards, advertising, architectural ornament, bookplates, figurines, jewelry, silverware, dolls, costumes, labels, posters, certificates and cartoons. Although written entirely in German, Münchner Kindl devotees will find the illustrations to be very absorbing, and the essential information in the captions is easily understood. A chapter titled Künstlerentwürfe focuses on the artists/designers of many of these works, including Franz Ringer, Ludwig Hohlwein, Theodor Otto Hahn, Bruno Mauder (see figure 2), Carl Moos and the as-yet unidentified artist "TS," showing steins each of them designed. 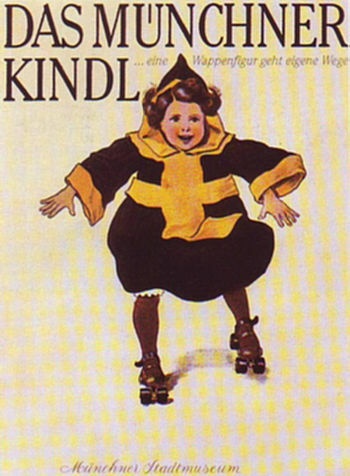 Otto Hupp is represented by illustrations of the covers of six of his Münchener Kalendar, each showing a different treatment of the Munich Child. Many stein collectors will be sorry to have missed the exhibition, but the book helps to make up for that. *Post, Anton and *Thomas, Dr. Therese; Villeroy and Boch, 1885 Mettlach 1905; Wheeling, IL; Hans J. Ammelounx, 1975. Hardcover, 8.5" x 11.25", 368 pages, English and German. Includes a history of the production of stoneware at the Villeroy and Boch factory at Mettlach, a short treatment of marks, and reproductions of several fully illustrated catalogs, supplements and price lists from 1885 to 1905. The catalog pages show form number, height, capacity, brief description (title), and the original prices, with and without lids. This is an important source work for Mettlach specialists. Out of print, occasionally available on the secondary market. Schmoll, J. A. and *Thomas, Dr. Therese; Heinrich Schlitt 1849-1923. Softcover, 9" x 8.25", 144 pages, English and German. The cover of this book shows a painting titled "The Painting Dwarf" by this highly popular artist who worked for Mettlach. The book includes a biography, examples of Schlitt signatures, and index of Schlitt's work for Mettlach, as well as numerous illustrations of paintings, ceramics and murals. Out of print, difficult to find. Scholz, Renate; Humpen und Krüge - Trinkgefäße 16.-20. Jahrhundert ; Munich, Germany; Keyser Sammlerbibliotek; 1978. Softcover, 6" x 8.5", 164 pages, German. An illustrated survey of steins and drinking vessels from the 16th to the 20th century. Illustrated. Out of print, rarely found. *Stevenson, James R.; Antique Steins, A Collector's Guide (2nd Ed. ); NY, NY; Cornwall Books; 1989. 223 pages, English, estimated values, profusely illustrated in b&w and color. *Vogt, Johannes and Vogt, Peter; Alte Bierkrüge, Battenberg Verlag, Augsburg, Germany, 1993. Softcover, 8.25" x 9.75", 84 pages, black and white and color photographs, German. This is an illustrated survey of many different types and periods of steins. Steins are described and estimates provided (in DM, of course). May be available on the secondary market, most likely in Germany. *Vogt, Peter; Fayence und Steinzeug aus vier Jahrhunderten, published by the author, Munich, Germany. Hardcover, 8.25" x 8", 141 pages, German. This is an illustrated catalog, each page showing and describing one piece of faience or stoneware, including many steins. All photographs are large format, professionally done and in full color. This is an excellent reference for the study of these older pieces, but also very enjoyable for the less-specialized collector. Out of print, difficult to find. *Wald, Mike; HR Steins Cataloged and Photographed; Kingston, NJ; SCI Publications; 1980. Softcover, 8.75" x 5.75", 116 pages, English. This book remains the only attempt at compiling a catalog of works by HR. Introductory chapters describe investigation into the origins and history of the various HR marks, and characteristics of HR steins. That is followed by a compilation of HR steins, complete with descriptions and black and white photographs. Out of print, has been reproduced several times, hard to find. Auction Catalogs are an invaluable source of information on pricing and availability of steins. While steins may show up in virtually any auction from time to time, and occasionally a collection will be sold at special auction, these dealers publish catalogs and conduct auctions on a regular basis which are devoted to beer steins and related items. Anonymous compilation, The Official Collector's Guide to Anheuser Busch Steins, Anheuser-Busch, 1993. Bosch, Helmut; Die Nürnberger Hausmaler; Klinkhardt & Biermann; Munich, Germany; 1984. Hardcover, 9.5" x 11.25", 598 pp., German. Bosch, Helmut; Deutsche Fayencekrüge des 17. Und 18. Jahrhunderts; Verlag Philip von Zabern; Mainz am Rhein, Germany; 1983. Hardcover, 9.5" x 12.5", 228 pp., English and German. Dry-von Zeschwitz, Beate; Westerwälder Steinzeug des Jugendstils IV, Rosskopf & Gerz, Steinzeugfabrik; Verlag Dry; Munich, Germany; 1982. Softcovre, 8" x 11.75", 60 pp., English and German. Dry-von Zeschwitz, Beate; Westerwälder Steinzeug des Jugendstils I, R. Merkelbach, Grenzhausen und München; Verlag Dry; Munich, Germany; 1981. Softcover, 9.5" x 6.5", 128 pp., German. Erlebach, Jürgen, and Schimanski, Jürgen; Die Neue Ära, 1900 - 1930; Contur-Verlag; Düsseldorf, Germany; 1987. Softcover, 8" x 8", 132 pp., German. Finke, Uwe Chr. ; "Drinck mich aus und schenk mich ein"... Trinkgefaße aus fünf Jahrhunderten; Keramikmuseum Westerwald, 1991. Softcover 8.25" x 11.75", 147 pp., English and German (Catalogue of the Rastal collection in the Westerald Ceramic Museum). Gaimster, David; German Stoneware, 1200-1900; British Museum Press, London, 1997. Hardback, 9" x 11", 430 pp., English. Horschik, Josef; Steinzeug; Verlag der Kunst; Dresden, Germany; 1978. Hardcover, 9.75" x 12", 496 pp., German. Klinge,Dr. Ekkart; Creussener Steinzeug; Druckhaus Neue PRESSE; Coburg, Germany, 1977. Softcover, 8.25" x 8"; 120 pp., German. Klesse, Brigitte and Mayr, Hans; European Glass from 1500-1800; Kremayr & Scheriau; Vienna; 1987. Hardcover, 9.5" x 10.75", approx. 600 pp., English. Lipp, Franz Carl; Bemalte Gläser; Verlag Georg. D.W. Callwey; Munich, Germany; 1974. Hardcover, 10" x 11.25", 188 pp. Plus 17 full-color tip-ins; German. Lüthgen, G. E., Westerwälder Steinzeug des Jugendstils III, Deutsches Steinzeug; Verlag Dry; Munich, Germany, 1981. Softcover, 8" x 10", 10 pp., German. Nagel, Gert; Fayencen; Battenberg Verlag; Munich, Germany, 1977. Softcover, 8.25" x 9.75", 165 pp., German. Strauss, Konrad, and Aichele, Frieder; Steinzeug; Battenberg Verlag; Augsburg, Germany; 1992. Hardcover, 8.25" x 10", 180 pp., German. Swarzenski, Georg; The Art Collection in the Heylshof at Worms; SCI Publications; Kingston, NJ; 1984. Softcover, 8.5" x 11", 56 pp., English and German. von Saldern, Axel; German Enameled Glass; The Corning Museum of Glass, Corning, NY, 1965. Hardcover, 8.25" x 12", 474 pp., English.